Data from robotic ocean floats reveal that waters off Antarctica don’t absorb as much carbon as scientists thought. The Southern Ocean is one of humanity’s allies, slowing global warming by absorbing heat and carbon dioxide from the atmosphere. 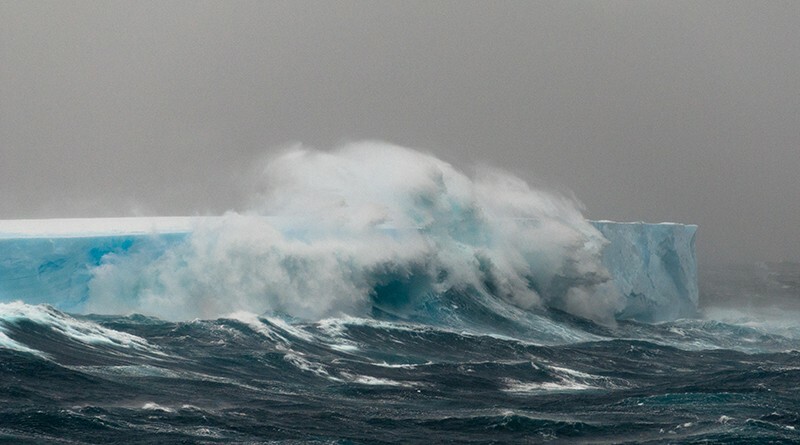 But now researchers report that the choppy waters around Antarctica are also quietly belching out massive quantities of CO2 during the dark and windy winter, reducing the ocean’s climate benefit. The scientists behind the work, presented this week at a meeting of the American Geophysical Union in Washington DC, say that the winter emissions reduce the Southern Ocean’s net uptake of CO2 by 34%, or more than 1.4 billion tonnes per year. That amount is roughly equal to Japan's annual carbon emissions. The ocean’s winter CO2 emissions, which were tracked by a fleet of robotic floats, occur when deep waters rise to the surface and release centuries-old carbon. This is part of a larger process of ocean circulation that moves heat and nutrients around the globe, but researchers have struggled to pin down precisely how the overall system works, in part because of a dearth of data. For years, scientists have based their estimates of carbon uptake in the Southern Ocean on measurements made by ships sailing to and around Antarctica, but the data are sparse — particularly for the winter months. The new research factors in 3.5 years of data from 65 floats deployed as part of the US$21-million Southern Ocean Carbon and Climate Observations and Modeling (SOCCOM) project. The floats bob up and down in the upper 2,000 metres of the ocean, measuring temperature, salinity, oxygen, carbon and nutrients — information that can be used to infer how much carbon is moving into and out of the ocean. The first estimate based on the SOCCOM floats alone, published in August, reduced the Southern Ocean’s carbon uptake by more than 90%1, compared with previous calculations based on ships’ measurements. But the discrepancy raised eyebrows, and prompted concerns about potential bias in the float estimates. To produce its latest estimate, which includes float and ship data, the SOCCOM team worked with researchers who have helped produce ship-based estimates for the Global Carbon Project, an international consortium that tracks the carbon cycle. Bushinsky says the team is reviewing incoming float data to discover what is causing the discrepancy with the ship-based measurements. The scientists are also trying to determine whether the ocean’s winter CO2 burps are a regular occurrence or a short-term trend caused by natural variations in ocean circulation. The team is adding more floats to its armada, to bring the total to around 200, which should help this work, says Peter Landschuetzer, a biogeochemist at the Max Planck Institute for Meteorology in Hamburg, Germany. But the SOCCOM floats have already given scientists a better look at the Southern Ocean, says Corinne Le Quéré, director of the Tyndall Centre for Climate Change Research in Norwich, UK. And although the Southern Ocean is doing less to moderate global warming than scientists thought, evidence is mounting that its influence on climate will grow during this century, says Joellen Russell, an ocean modeller at the University of Arizona in Tucson who heads SOCCOM’s modelling team. One recent study found that Antarctic meltwater flowing into the ocean creates a layer of cold, fresh water that pushes warmer, saltier water up under the continent’s ice shelves, accelerating ice loss2. Researchers used a climate model to look ahead to 2100, and project that this flow of meltwater will cool the region and slow the increase in average global temperatures, even as it accelerates Antarctica’s contribution to sea-level rise. Now the SOCCOM team is taking a closer look at the powerful winds that circle Antarctica, which have strengthened and moved polewards over the past several decades. Few climate models simulate this process. But in unpublished research, the SOCCOM scientists have found that their model better reproduces the data collected by floats when it incorporates more-realistic simulations of Antarctic wind patterns and meltwater flows. “We now have a cookie-cutter approach for telling whether our models are getting the Southern Ocean right,” Russell says. At present, none of the SOCCOM climate models incorporate the effect of fresh water from melting sea ice into their projections, but that may soon change. Project scientists are working to organize a series of experiments to address this with other climate modellers around the globe. Gray, A. R. et al. Geophys. Res. Lett. 45, 9049–9057 (2018). Bronselaer, B. et al. Nature 564, 53–58 (2018).